Affordable Bordeaux is proving popular in Sainsbury’s despite suggestions consumers are looking elsewhere. Speaking to the drinks business, Michelle Smith, French and fine wine buyer at the supermarket, said that both red and white Bordeaux “remain an important part” in the multiple grocer’s wine sales. The supermarket has a range of own-label Bordeaux lines from House Claret to Taste the Difference St Emilion, but Smith picked out Château David Beaulieu as a particularly popular label from the region, and said that Sainsbury’s sells 4,000 bottles of the wine each week. Overall, value sales of red Bordeaux at the supermarket are up 5.2% (Nielsen Scantrack 52 week ending 14.05.11) and nearly 40% of all French red wine sold by the grocer is from Bordeaux. White Bordeaux is also in growth, up 20% by value over the same period to account for 45% of the supermarket’s sales of French white wine. However, the performance of white Bordeaux at Sainsbury’s is in marked contrast to the rest of the UK retail market, with figures showing a 55% decline for this style in multiple grocers. Similarly, sales of red Bordeaux across the rest of the supermarket category are not in line with Sainsbury’s experience, and overall, red Bordeaux is only just in growth, at 0.2%. As for average bottle prices across the UK off-trade, Bordeaux is almost £2 more expensive than the market mean, costing £6.40 as opposed to £4.60 for total wine sales. 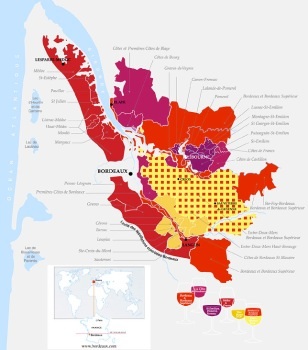 Speaking of a good price-to-quality ratio achievable in Bordeaux, Jérôme d’Hurlaborde, export director for Northern Europe at AdVini, told db: “The Right Bank regions of Fronsac, Canon-Fronsac, the Côtes and the satellites of Saint-Emilion are superb value for money. For more on France’s performance in the UK off-trade see the October edition of the drinks business.